Shakti puja means worship of power in divine form is performed in many form ,most popular is worship of goddess KALI.One famous temple of maan kali is at rajrappa.It is situated 28 km away from Ramgarh on the confluence of rivers Bhairavi (locally known as bhera) and Damodar. This temple known as Chinnamastika temple, finds place in our Vedas and Puranas and it has been recognized as an ancient and strong source of Shakti.It is described as rajtappa . It is believed that the person who devotes himself whole heartedly with pious heart to Maa Chinnamastika has all his wishes fulfilled by the Goddess.Followers of tantra puja perform secret rituals to get holy powers. Devotees from all corners of Jharkhand, Bihar and West Bengal visit this holy place throughout the year. There is a large congregation of people here during the night of full Moon and New Moon. Marriages are also solemnized here on a large scale. 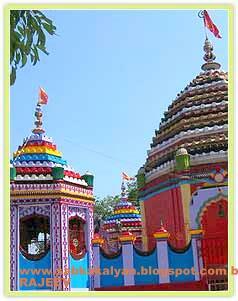 The Art and architecture of Rajrappa temple bears resemblance to that of the famous Kamakhaya temple of Assam. Here, in addition to the temple of Maa Kali, there exists ten temples of various Gods and Goddesses like the Sun God and Lord Shiva. there is a small temple for Krishna and Anjaneya. Maheshwara, and the Ashta Lakshmis. Chhinna Mastha, for whom there are separate temples). Navagrahas. There is also a separate temple for Kali. enormous murthi with saptha ashwas. North, we can touch the main deity. and do parayanam without being disturbed. itself . Animal sacrifice is done after fulfillment of wishes.Other Hindu rituals including marriage,mundan are also performed with great devotion . in july 2010 there was a big breach of security when robbers stolen silver umbrella and severely damaged the idol.however soon the worship has been restored. Rajrappa also is a pilgrim place for "Santhal Tribe" who comes for immersion of their loveones ashes in the Damodhar river. In the group they comes mostly during the Month of December, the group are known as "Yatri". Mostly they come from South of Jharkand state as East and west Singhbhum and Saraikela district.In their mythology tribe they believe it is their final destiny. In their Folk song Rajrappa is Known as "Thel kopi Ghat"(Water Ghat) which means they used oil after bath.The hot water spring adds beauty to this temple and during winter it turns into picnic spot. Apart from the religious view this site is famous for large coal mines .Rajrappa is a project under Central Coalfields Limited (CCL), a subsidiary of Coal India Limited. It is one of the biggest coal-fields in its region. It is widely known as the Rajrappa Project, which consist of the main quarry (a huge open cast mine), offices, colonies, recreation facilities, shopping complexes, a police out-post and public utility buildings. It is a complete township in itself.The Bhera or Bhairavi joins the Damodar, falling from a height of 9.1 metres (30 ft). It is a scenic spot. Rajrappa Falls has tremendous geographical significance. The Damodar valley at Rajrappa is a typical example of polycyclic valley or topographic discordance which is characterized by two storey valley. The Damodar developed its broad and flat valley of senile stage before the onset of Tertiary upliftment. The river was rejuvenated due to upliftment of landmass during the Tertiary period (65 million to 1.8 million years ago) by the side effects of the Himalayan orogeny and thus the Damodar excavated its new deep and narrow valley of youthful stage within its broad and flat valley of senile stage. The Bhera river coming from over the Ranchi plateau makes a waterfall while joining the Damodar and thus presents an example of a hanging valley. The Damodar gorge near Rajrappa is a typical example of incised meander. For accommodation Dhramashala, rest house and Guest house are easily available at Rajrappa. This site is also well connected to Ramgarh by road.trains to delhi from ranchi passes through Ramgarh cant. station.Ramgarh cant is also of tourist attraction as it is one of the oldest army cant. of panjab regiment.tourist can also reach here by Taxi and bus from Bokaro,dhanbad patna and ranchi.It is well connected by Delhi,patna,ranchi and kolkata by Trains nearest station is Ramgarh.the nearest airport is Ranchi airport.Native airlines offer service at Ranchi .